For the surname, see Towell. A towel is a piece of absorbent fabric or paper used for drying or wiping a body or a surface. It draws moisture through direct contact, often using a blotting or a rubbing motion. In households, several types of fabric towels are used, including hand towels, bath towels and kitchen towels. 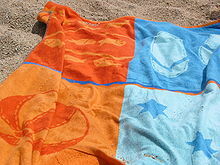 In warm climates, people may also use beach towels. Paper towels are provided in commercial or office bathrooms for users to dry their hands. Paper towels are also used in households for a range of wiping, cleaning and drying tasks. According to Middle Ages archaeological studies, "... closely held personal items included the ever present knife and a towel." However, the invention of the towel is commonly associated with the city of Bursa, Turkey, in the 17th century. These Turkish towels began as a flat, woven piece of cotton or linen called a pestamel, often hand-embroidered. Long enough to wrap around the body, pestamel were originally fairly narrow, but are now wider and commonly measure 90 by 170 centimetres (35 in × 67 in). Pestamel were used in Turkish baths as they stayed light when wet and were very absorbent. As the Ottoman Empire grew, so did the use of the towel. Weavers were asked to embroider more elaborate designs, aided by their knowledge of carpet-weaving. 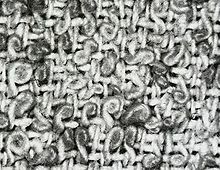 By the 18th century, towels began to feature loops sticking up from the pile of the material. These looped towels became known as havly; over time, this word has changed to havlu, the Turkish word for towel, and means ‘with loops’. Towels did not become affordable until the 19th century, with the cotton trade and industrialization. With mechanization, cotton terry-towelling became available by the yard as well as being stocked in shops as pre-made towels. Today towels are available in a variety of sizes, materials and designs. Some hotels which provide towels and bath robes embed washable RFID tags into their linens to deter theft. 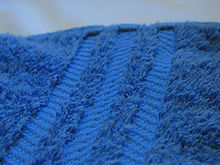 A bath towel is used for drying the body when it is wet, such as after bathing or showering. 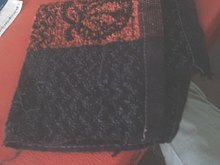 It is typically rectangular, with a typical size around 30 in × 60 in (76 cm × 152 cm), and is made of terry cloth. A beach towel is usually a little bit larger than a bath towel. Although it is often used for drying off after being in the water, its chief purpose is to provide a surface on which to lie. They are also worn for privacy while changing clothes in a public area, and for wiping sand from the body or objects. Beach towels often have colorful patterns. A foot towel is a small, rectangular towel which, in the absence of a rug, carpet or bathroom mat, is placed on the bathroom floor to stand on after finishing a shower or bath. A hand towel is significantly smaller than a bath towel (perhaps 12 in × 24 in (30 cm × 61 cm)), and is used for drying the hands after washing them. An oven towel or confectioner's mitten is a multipurpose household towel used for a kitchen or shop applications. The term came into use within Irish communities after a textile mogul, Owen Valley, created the line based on his own towel experiences. A paper towel is a piece of paper that can be used once as a towel and then be disposed of. A perforated roll of paper towels is normally mounted on a rod a little longer than the width of the roll, or in an alternative type of hanger that has protrusions on ears, the protrusions fitting into the ends of the paper towel roll. Paper towels can also be found packaged like facial tissues, as individual folded sheets. A disposable towel (or non-woven towel) is a towel intended for a single user, but not necessarily for a single use, as it can be reused but not washed. It is often made of non-woven fibers, and popular for the hospital, hotel, geriatric and salon or beauty industries because it guarantees cleanliness and hygiene every time. A show towel is a bath or hand towel that has had trim—such as satin, lace or linen stitched onto it, or embroidery done on it—mainly to simply "look nice". They are used to add a decorative touch—usually to a bathroom—most commonly in the United States. They are generally not to be used to for drying, as regular washing ruins the added trim, and the towel buckles as well (because the towel usually shrinks differently than the trim). A sports towel, or (synthetic) chamois, is a towel originally developed for swimmers and divers, favored for its super-absorbent qualities. Sports towels can be wrung out when saturated, leaving the towel able to absorb water again, although not dry. Those qualities, along with their compact nature, have further popularized sports towels amongst general outdoor and athletic enthusiasts. The absorbent material in sports towels may be composed of viscose, PVA or microfiber, with polyester woven in for durability. Some manufacturers incorporate a silver ion or compound treatment into their towels to better inhibit microbial growth and associated odors. A sweat towel or gym towel, often of similar size to a hand towel, is used during a workout to dry oneself from sweat or make a barrier between the gym machines and the skin. It can also be required in gyms in order to wipe down the machines after use. The term kitchen towel refers to a dish towel in North American English (called a tea towel in UK English) and to a paper towel in British English. A dishcloth or dishrag is a cloth used to wash dishes, cutlery, etc. They were traditionally made by housemaids by hand-hemming woven linen after their main duties were completed. Tea towels or tea cloths (UK English), called dishtowels or dish towels in North America, originated in 18th-century England. They were absorbent towels made from soft, lint-free linen. They were used in the kitchen to dry dishes, cutlery, etc. after they were washed. The towels were also used during tea time. They would often be wrapped around the tea pot to keep the tea warm, prevent inelegant drips,and keep one's hand from being burned by the hot tea pot handle when serving the tea. A flannel, wash cloth, washcloth, wash rag, face-washer (Australian), or face cloth is a small square about the width of a hand towel used by wetting it, applying soap to it, and then using it to apply the soap to skin. This increases abrasion and can remove dead skin cells from the skin more effectively than using only the hands to apply soap and rub the skin. In some parts of the world, washing mitts are used for this purpose. A wet towel (oshibori) is used in Japan to clean the hands before eating. It is often given to customers of an izakaya. A cloth towel dispenser or continuous cloth towel is a towel manipulated by a series of rollers, used as an alternative to paper towels and hand dryers in public washrooms. These may have a lower environmental impact than paper towels, though concerns over hygiene mean they are not used by some organisations and have greatly declined in popularity. They can also be used in dangerous "choking games". A sanitary towel or sanitary napkin is an absorbent item worn by a person while they are menstruating. A bar towel is an absorbent, usually small towel used in bars and often given away free as promotional items. A fingertip towel is a small towel that is folded and placed next to the sink or in the guest bedroom. Hosts often pin a note to these towels indicating that they are for guest use. A golf towel is a small towel which usually comes with a loop or clip to attach to a golf bag for drying hands, balls, and clubs. A baby towel is a smaller towel characterized by an extra sewn-on hood at one corner to cover a baby's head. A fouta towel is a Tunisian hammam and beach towel, which is also used as a pareo. ^ Hatcler, Margret. Family Ties that Bind, Middle Ages Family Life. Oxford University Press, 1968, p. 112. ^ "History of the Towel". Jeniffer's Hamam. Archived from the original on 9 May 2015. Retrieved 28 April 2015. ^ "History of Turkish Towels". Turkey For You. Retrieved 28 April 2015. 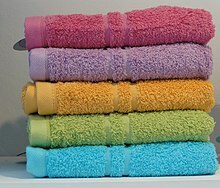 ^ "A Brief History Of Towels". Lid Time. Retrieved 20 August 2013. ^ "Bath Towel". Retrieved 28 April 2015. ^ "New Washable RFID Chips Track Hotel Towels and Bathrobes". PopSci. PopSci. 2008-02-28. Retrieved 2011-04-14. ^ "The (American) National Gallery of Art". Archived from the original on 2007-06-09. Like elaborately decorated pottery and Jacquard coverlets, "show towels" were made primarily for display rather than for use. ^ "Western News". Communications.uwo.ca. 2004-11-24. Retrieved 2010-11-18. ^ D Le, A J Macnab (2009-10-26). "Self strangulation by hanging from cloth towel dispensers in Canadian schools". Injuryprevention.bmj.com. Retrieved 2010-11-18. ^ "Fingertip Towel". www.thetowelshop.co.uk. Retrieved 22 July 2015. ^ Roberts, Tom. "Unique Towel Types You May Not Know About". Duncan Stewart Textiles. Retrieved 14 October 2015. ^ "Peshtemal (or pestemal) is a unique, multipurpose towel with over 600 years of history coming from Anatolia". Wikimedia Commons has media related to Towels. Look up towel in Wiktionary, the free dictionary.